Ride in comfortable style with the recumbent Lifecore 1060RB. With its ergonomic design and 47 preset workouts, this exercise bike is built to motivate and support diverse trainees with smooth body-friendly motion. It supports three profiles and is adjustable to fit a wide range of trainees. Quiet magnetic resistance helps it keep quiet through workouts of any intensity too. Read on for a full review including pros, cons, workout programming and details about special features. 63" x 27.9" x 49.1"
The $1,899 Lifecore 1060RB is a high quality recumbent exercise bike for weight loss and cardio training at home. It’s sold with a long warranty for residential use and is backed by high quality customer service. As a recumbent bike the 1060 RB puts minimal stress on your body by distributing your weight away from the knees and other sensitive joints. It positions your legs out front and lets you lean back with the comfort of a foam-padded cushion and great lumbar support. To help you make the most of each exercise session this bike supports multiple user profiles and has 47 training programs that meet varied exercise goals. Read on for details about the bike’s many workout programs and other features. Fat Burn, Hill and Interval. Others are Lap 5K, Lap 10K and Random. A fitness test is included too; you can use the fitness test every four to six weeks to assess your progress. For quick navigation you can set up eight keys for most-used programs and eight for resistance. There’s also a Quick Start button. Choose from English and metric settings. The monitor has two settings (brighter light and lower light). The Lifecore 1060RB offers very low-impact cardio training with its recumbent frame. A step-through design makes it easy to get on and off the machine. While leaning back in comfort you can burn calories, tone your body and exercise your heart. The bike seat is nicely padded, has six height adjustment settings, and has three positions for lumbar support. Also contributing to comfort are Lifecore bike pedals with a 2º inward slope for good biomechanics. This exercise bike is iPod compatible. It has an MP3 player port and high fidelity 3 watt speakers. The USB port can charge a mobile device. The console has a cooling fan and two beverage holders. To help you train in your target heart rate zone, the Lifecore 1060RB can be used with a wireless chest strap (sold separately). Grip sensors are built in too. Heart rate data can be used to control six of the preset workout programs. 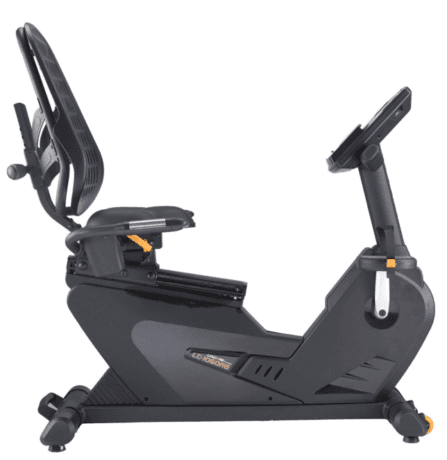 The 1060RB from Lifecore is a solid recumbent bike that’s loaded with workout programming. It’s a smart choice for weight loss and cardio training that’s easy on joints. Given its overall quality and long warranty, this bike is a top value in its price class.